It’s definitely tempting to indulge in peanut butter straight from the jar. Typically I would say a tablespoon is a reasonable and satisfying portion. 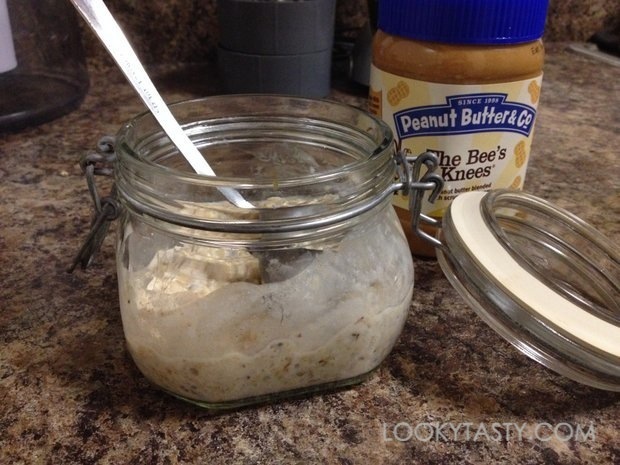 What to do with a spoonful of peanut butter? 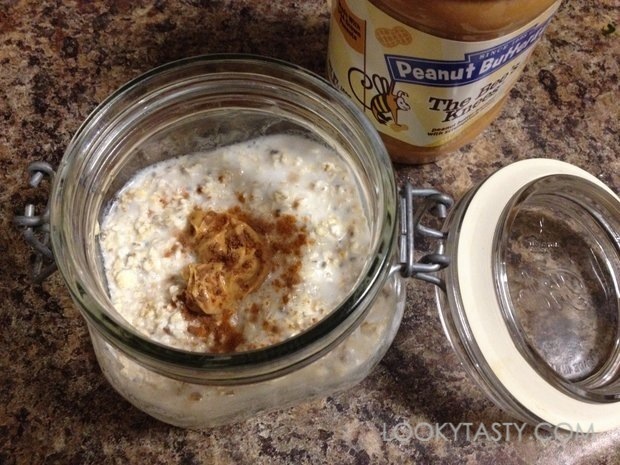 One of my favorite things to do with a spoonful of peanut butter is to incorporate it in my breakfast, say peanut butter oats! I have two jars of peanut butter sitting on my kitchen counter thanks to Peanut Butter & Co. (You can get two jars too. Hold on for the giveaway!) The Bee’s Knees is their all natural peanut butter blended with honey. There’s no cholesterol, no trans fats, no hydrogenated oils, and no high-fructose corn syrup. It is also gluten-free, vegetarian, and certified kosher. 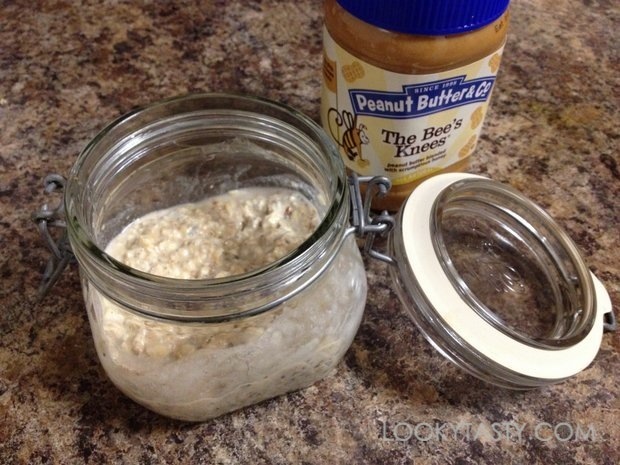 I decided to mix it with my overnight oats, which I had prepared in a glass mason jar, for a sweet, delicious breakfast. Combine oats, milk, yogurt, and chia seeds in a bowl or mason jar and cover. Leave it a warm place overnight or at least 6-7 hours. When ready to serve, top with a spoonful of peanut butter. Sprinkle cinnamon and cocoa powder. 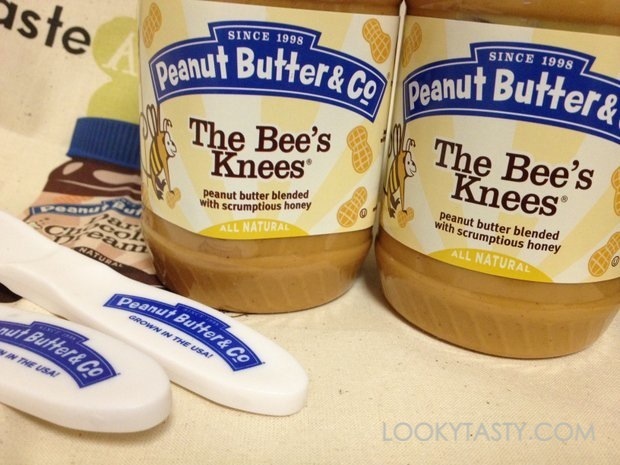 One lucky reader will receive two jars of The Bee’s Knees peanut butter! Enter the giveaway using the Rafflecopter widget below. U.S. residents only. Giveaway ends on Monday, May 26, 2014 12:00 PM ET. What would you do with a spoonful of peanut butter? I like peanut butter on an English Muffin and in my smoothies. I like to enjoy peanut butter on a toasted english muffin. I like mine in a peanut butter & jelly sandwich! I like peanut butter on apples and celery-crunchy and yummy at the same time! I like to have peanut butter in my smoothies and in oatmeal. I like peanut butter with cinnamon sugar. I enjoy my peanut butter mixed with other tasty ingredients, namely cocoa powder and shredded coconut and chia seeds and cinnamon.. Grab a spoon and enjoy! I like my peanut butter in cookie and pb&j form. Cover it in chocolate chips! I love just about anything with peanut butter involved!! I would eat it, plain jane! As a matter of fact, I normally have one tablespoon of the white chocolate peanut butter every day. Whoops! Haha. I can’t help myself. It’s so delicious! I spread it on cut up apples slices for a healthy snack! I enjoy putting my peanut butter into cookies! Sometimes I put some cran-raisins, chocolate chips, and nuts in the spoon with the peanut butter- to get a quick pick me up. I love peanut butter with a banana on some toast! Thanks for the chance to win! On a spoon, straight from the jar…yum! I usually eat out of the jar, but I like it with bananas, too. 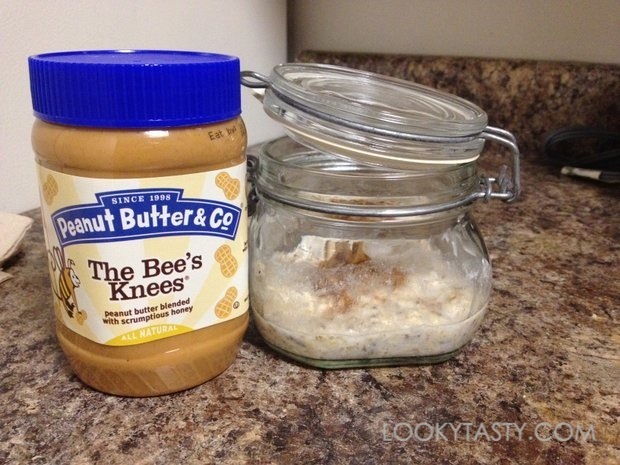 Nothing better than Bee’s Knee’s peanut butter and a tall glass of milk! I enjoy my peanut butter with chunks of celery and strawberries!! I love peanut butter and honey sandwiches. 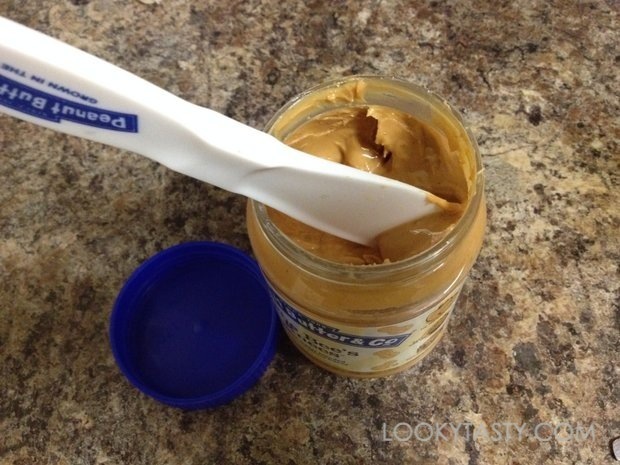 I can eat peanut butter with a spoon, or a sandwich with grape jam, or celery, or apples, or carrots, or………. the list goes on and on! I don’t like almond milk , can I use coconut milk instead? With fruit like bananas, on froyo, on rice cakes, out of the jar! Anything u can think go I eat with peanut butter!!! I love baking and making candy with it. I just made peanut butter fudge! I like it on lightly buttered toast, especially rye. I love to lick it straight off a spoon. I also love to put it on a cinnamon raisin bagel! Peanut Butter fudge is my favorite way to eat peanut butter. I like to drip pretzels into the jar. I love peanut butter in a PB &J sandwich on white bread and also in cookies. I love peanut butter on my waffles with bananas. I love peanut butter on apples, bananas, celery….even by the spoonful! I love adding peanut butter to apple slices for a healthy snack. I also love a classic peanut butter and jelly sandwich a few times a week. I love it in lunches for PB&J! Right out of the jar, on crackers or on a sandwich! I love peanut butter! I like peanut butter on my pancakes with real maple syrup. Thanks for the giveaway…like peanut butter between two slices of whole wheat bread ! I mix it into my Greek yogurt.